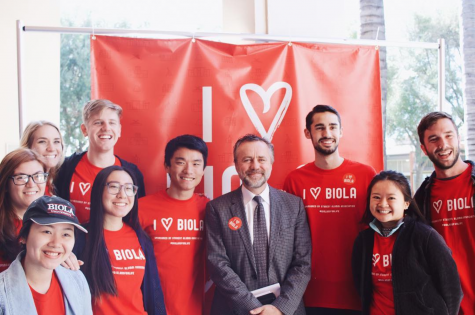 Students took charge of Biola’s annual sexual assault awareness campaign for the first time. The Biola community rallied around survivors of sexual assault this week, championing awareness of the often-taboo subject through a series of displays and dialogues. The campaign to improve sexual assault awareness involved opportunities for members of the community to write notes of encouragement to sexual assault victims, write about their experiences on a white shirt, march through campus and sit in on a discussion of the issue. April is Sexual Assault Awareness Month, a national campaign that has been observed at Biola in the past. This year, however, is the first in which the events were planned by students. The coordinators of the various events were all students in Muehlhoff’s Communication of Gender class. The group of roughly 25 students partnered with Title IX coordinator Dawn White and has been planning the event since the beginning of the semester. 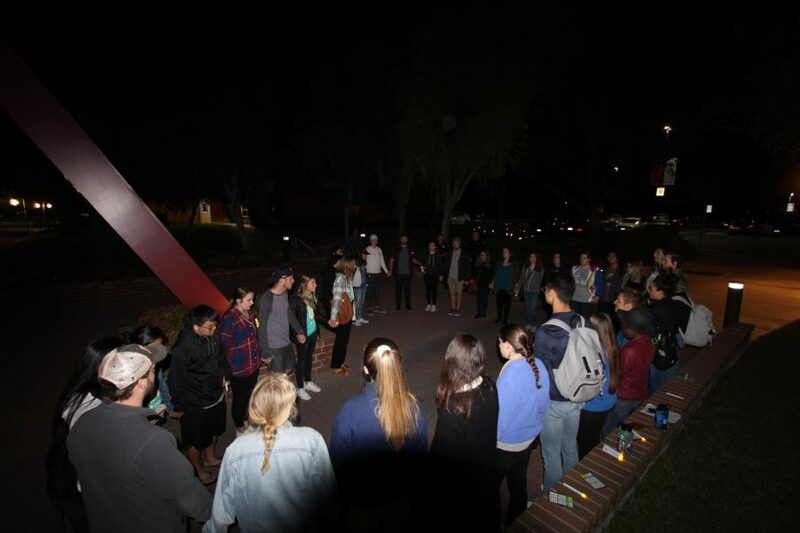 On Wednesday evening, the class led around 50 students on a walk through several places on campus where sexual assault has occurred. Associate professor of New Testament Jon Lunde opened the evening with a short address, using the story of Job to provide comfort for times when questions outnumber answers. By the glow of the crowd’s white candles, Lunde emphasized the hope given by the light of Christ. Attendees then marched through campus in silent solidarity with those navigating through the cloud of darkness that follows sexual assault. The group paused at five places to reflect and pray over the reality of sexual assault that haunts students even on Biola’s campus. Junior sociology major Andrea Sabillon, who attended the march, said the awareness campaign has helped her to understand her part in the conversation on sexual assault. “Now I know that it’s not just on another person to talk about it, it’s on me also to go out and talk to friends about it,” Sabillon said. Over 100 students filed into Mayers Auditorium on Thursday evening to hear from a panel discussion of sexual assault awareness and response. The panel featured five speakers from Biola and OC United, a non-profit based in Fullerton, California that seeks to restore families and communities. Joining the panel from Biola were Muehlhoff, White and Campus Safety Chief John Ojeisekhoba. Two assault survivors associated with OC United, Donna Mroz and Jennifer Roberts, also sat on the panel, marking an unprecedented partnership between Biola and OC United. The panel was preceded by a presentation from Ojeisekhoba, followed by one from White. Ojeisekhoba shared strategies for risk awareness and prevention, highlighting several safety habits to practice while using rideshares or dating apps. White spoke on the importance of consent and the reasons behind under-reporting of sexual assault. 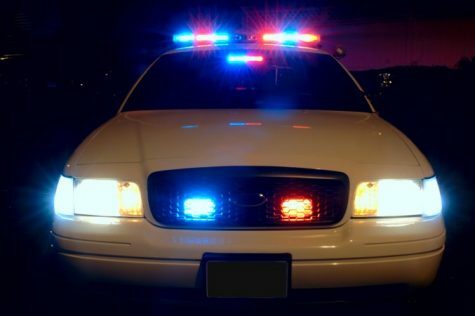 According to her, preconceived narratives of what constitutes sexual assault may color a community’s reception of cases that contradict those narratives. “It’s our natural tendency to fill in the blanks with our experiences and assumptions,” White said in her address. The speakers then fielded audience questions sent in via text message. The panel discussed a range of issues pertaining to sexual assault, including language used to describe the issue, red flags for abuse that would warrant reporting and how the school recognizes and responds to false accusations. White added that the school is in the process of instituting a policy that would enact disciplinary action for false accusations. Senior communication studies major Laura Bell was one of several students who helped put on the week’s events. She described her class’s efforts as a way of fighting obliviousness.